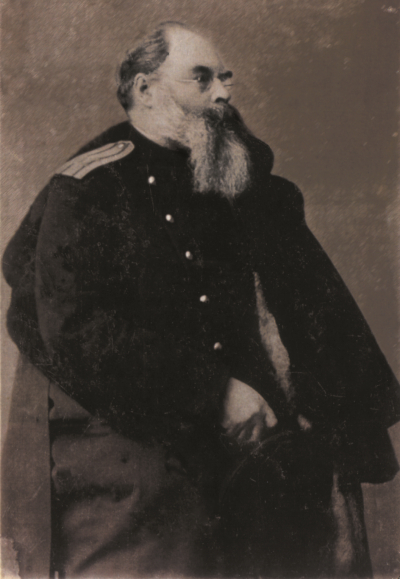 Half Russian, half Italian Nicola Argamante had a great-grandfather who was a general in the Russian army—he was a big beefy Victorianesque guy with a flowing beard and spectacles, and his image adorns the few bottles of excellent Pinot Nero that Nicola makes. Nicola is big too, but he doesn’t wear a cavalry uniform. The general died before the revolution. His son, a colonel, escaped Stalin’s Russia via Helsinki to live with his wife’s family in Vilnius, only to be arrested in 1939 by the Russian secret police. His son, Nicola’s father, made his way to Italy. Nicola was born in Tuscany and raised in Piedmont. There he met a lithe woman from Sardinia with jet-black hair, a fine roman nose, and a mesmerizing accent. They were at the University of Turin together: she was getting a post-graduate degree in viticulture; he a PhD in enology, and they fell completely in love. 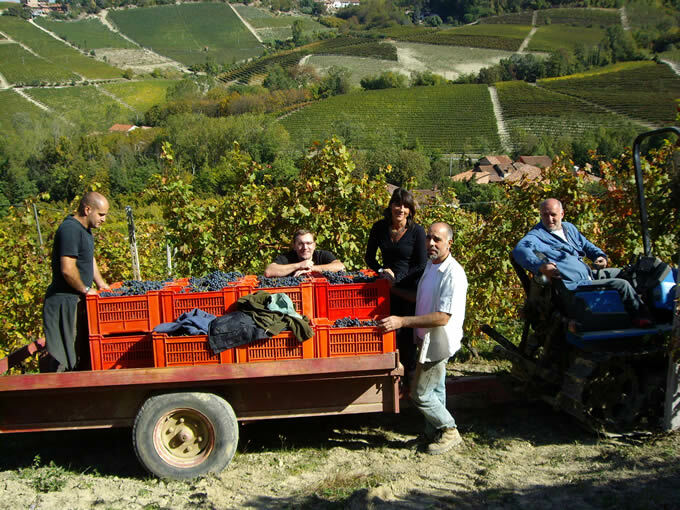 In the early 1990s Nicola was consulting for various producers in the Langhe while writing his papers and fulfilling his degree requirements when he stumbled upon the hamlet of Corsini. It lay tucked away in a little valley just north of Monforte d’Alba, a couple of houses and farm buildings surrounded by vines. He took Lorendana there. In 1995 they got married, bought the hamlet, and started their life together. Podere Ruggeri Corsini: farm + Nicola’s mother’s surname + name of hamlet. Nicola’s mother is in there because she provided money to make the purchase. Nicola still consults here and there, but mostly he is in the cellar while Lorendana is in the vines. They have 25 acres of vineyards divided among 24 parcels, and average just over 6,000 cases of wine each year. They walk a really nice line between traditionalists and modernists, meaning that their wines are transparent with clear impressions, while possessing superb drinkability. Some facts pertaining to the farm’s ecology: The lightest traditional bottle is used, to have a lighter carbon footprint. Solar panels provide most of the power for heating and lighting in the winery, and water used in winery operations is purified on site via a method of phyto-purification. In the vineyards, the only synthetic applications used are those based on copper and sulfur to fight mildew diseases. In the wines, SO2 applications are kept to a minimum, and the red wines are not normally fined or filtered (they throw deposit). Nebbiolo This comes from a one-acre parcel planted in 2002. The site faces east at 1,400 feet above sea level, the grapes are hand-harvested, and typically the wine is a result of a combination of saignée and direct pressing (roughly 50-50). Elevage is done in steel. This is not a shy, retiring flower of a rosé; it has substance and class, and it can age for a couple of years. Tech sheet here. Langhe Rosso Matot Normally based on Dolcetto, then Barbera and Nebbiolo and mixed blacks, in varying percentages depending on the year The one blended Corsini wine. This, effectively, is the farm s second label, created to enable it to keep a high standard with its other wines (everything is estate bottled at Ruggeri Corsini; nothing is sold in bulk to traders, a fact that makes quality control for a wine like Matot particularly important). Matot is, as Nicola says, a glass of Piedmontese red. Barbera A Piedmontese classic, Barbera is the mainstay of the farm, representing 40-45% of production. Made and aged in steel tanks. Quite dark, full, earthy and meaty, and carried by delicious acidity, the grape’s signature. 1,200-1,600 cases annually. Barbera A reserve Barbera, only made in good years. Base is 4.4 acres of vines planted in 1947 and 1959, wine is aged in mostly older wood vessels of various sizes. 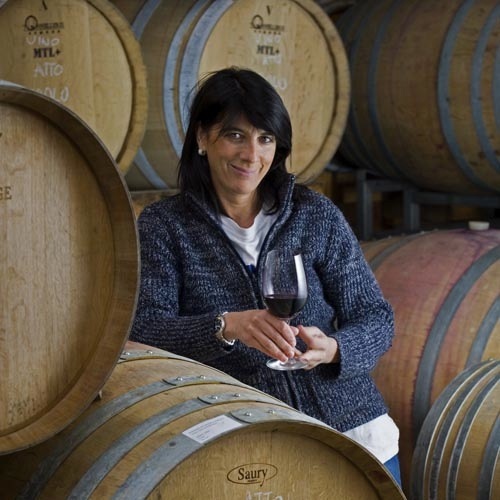 This may be the wine Nicola and Loredana are most proud of, and they bottle it in large formats. The word Armujan is dialect for apricot trees; one of these old hillside parcels once supported an orchard. When it’s made, 750 cases. 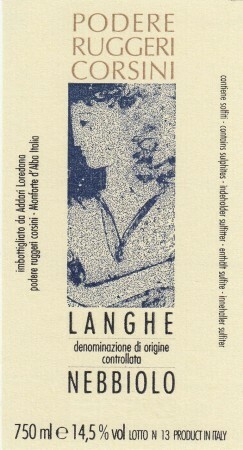 Nebbiolo DOC rules for Langhe Nebbiolo require 85% of the wine to be from the declared variety and vintage. Corsini’s is 100% Nebbiolo entirely from the declared vintage. This class of Nebbiolo has become the wine of choice for aficionados who can’t afford to drink Barolo every evening and who know that such wines often contain declassified Barbaresco or Barolo. Nebbiolo From just over 3 acres of vines growing rather high on the hillside at a southeastern exposure in thin, sandy topsoil. The most traditional of the farm’s Barolos, aged strictly in large old Slavonian oak casks (the forests are in Croatia) known as botte, or foudre in French. There is often a chalky minerality in this wine. Roughly 500 cases annually. From just under 3 acres of vines planted in 1965 and growing mid-slope at a southwestern exposure in calcareous soils. Bussia is one of Montforte’s finest vineyards, and this is the best ageing of Corsini’s Barolos. Raised in 225-liter barrels, 20-25% of which are new. Roughly 450 cases annually.